I always smack myself in the head when I leave Naramata Wine Bench wondering why I didn’t book a week off just so I could stay longer. It’s my favourite place in the Okanagan for its slow town nestled amongst rows of vineyards. Not only is it a quiet and relaxed town but it is also the best place to go wine tasting in the Okanagan. If you’re looking for a quick getaway in what feels like Canada’s Tuscany this is the quintessential wine lover’s town. Naramata is the wine bench neighbouring the city of Penticton. I’ve seen it described as a suburb of Penticton but it is more of an abutting district. It is all at once a world away from the big town feel of Penticton and yet it is so close by you could easily make the city your home base if Naramata is too small of a town for you. But for me looking to escape the busy streets of Kelowna as wayfaring tourists with red plates (Albertans) take over, Naramata is just what I need to recharge my batteries. You’ll want to stay in an AirBnB or in the very heart of Naramata when you visit. There are a few restaurants around the bench but if you have a kitchen you’ll find it easier and less expensive to make breakfast. Usually, I stay in the historic Naramata Heritage Inn but with the upcoming wedding we wanted to make our dollar stretch a little further. 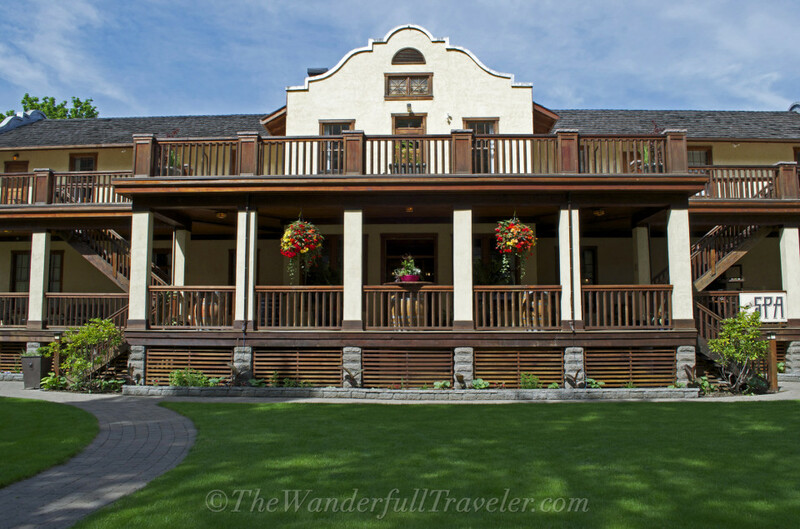 This time we opted for the amazingly well-priced Naramata Courtyard Suites fully equipped with kitchens, BBQs and is dog friendly for a surcharge. We also made good use of the grassy courtyard with bocce and ladder ball. It looks like Provence but it is actually Natamata, BC, Canada This is D’Angelo Winery and B&B and this is our view from the balcony. How great is that for such a great price too! If you want to feel like you’re in Provence instead of Tuscany then check out the accommodations at the D’Angelo Winery (pictured above) which includes a pool and patio adorned with vines of grapes and BBQ. If you do opt for a hotel without a kitchenette or you aren’t in the mood to cook then you can dine at the Naramata Heritage Inn’s breakfast at the Rock Oven. 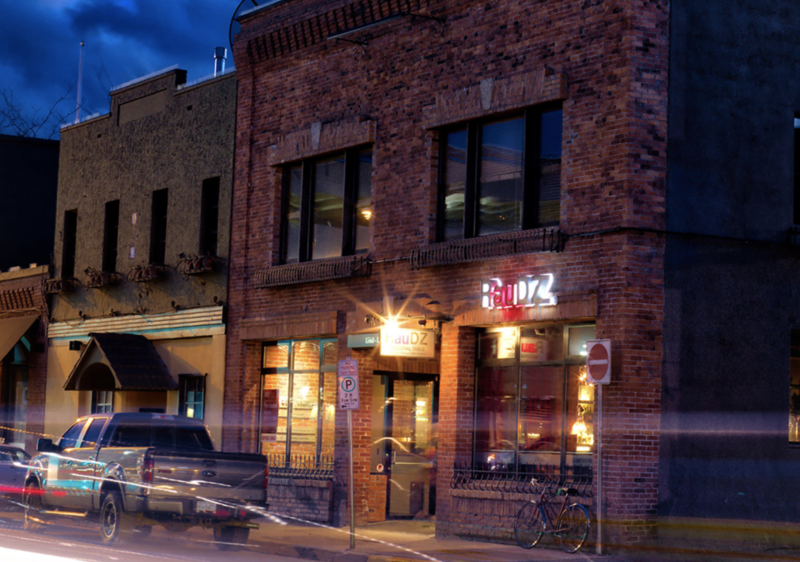 Formerly and affectionately known as the Cobblestone Wine Bar, the new owners changed the name and the food. You can still get the delicious charcuterie as a lunch option and the wines are fairly priced as compared to places in Kelowna and Penticton. If you don’t want a sit down affair then check out the Grape Leaf Cafe or Cafe Nevermatters both located across the street from our hotel. Beware, the patios are usually filled with peacocks displaying their impeccably kept feathers. While wine touring I highly recommend the Pecking Room for a quick bite with a view. 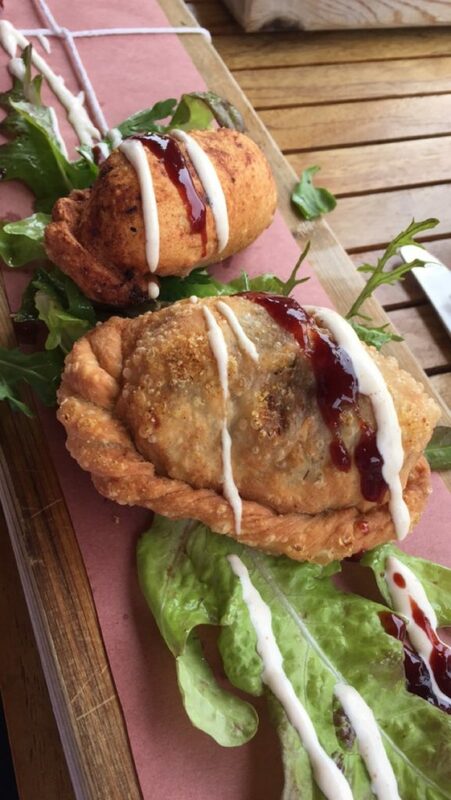 Located at the Red Rooster Winery, we treated ourselves to some amazing lamb empanadas (2 for $7). For dinner I always recommend the Hill Side Bistro but during our last visit a wedding had booked out the entire place so we stuck close to our accommodations and dined at the Rock Oven. 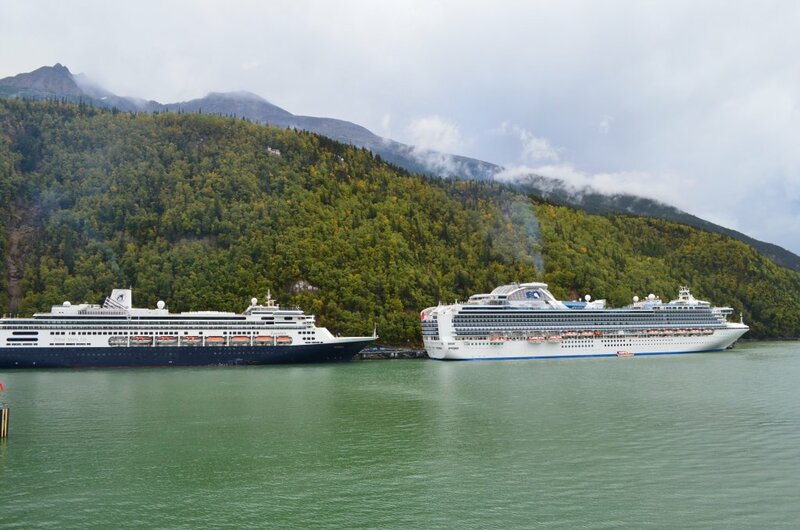 Think about limiting yourself to 4 or 5 wineries when you visit for the day. 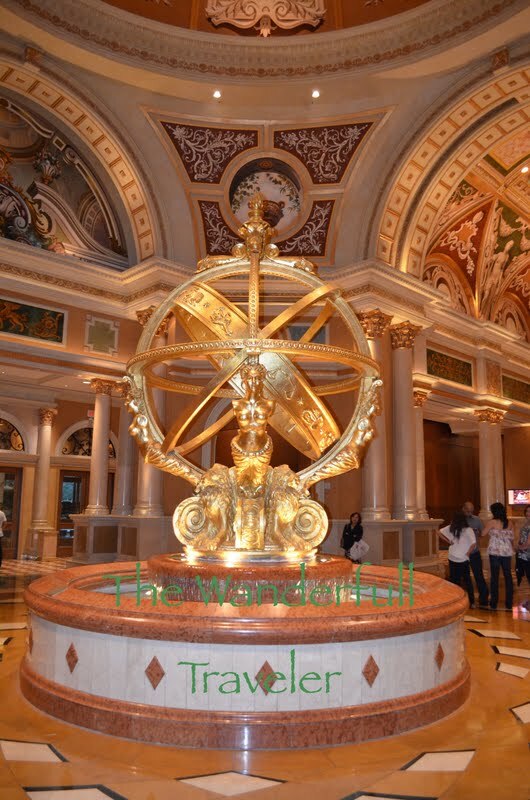 You can always hit another 2 or 3 as you exit town the following day to maximize your experience. I like to mix it up between old favourites with the addition of a few new ones. 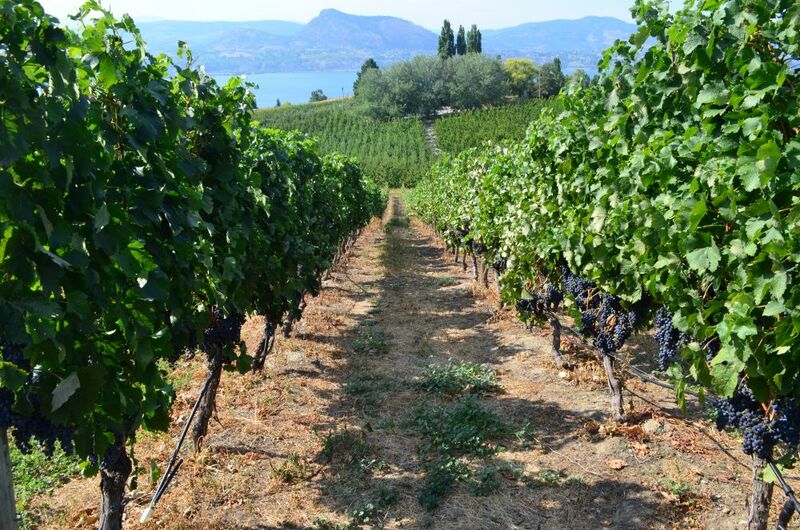 There are always new wineries added to the Naramata roster each year. It’s really amazing that such a small wine bench can produce so much and have such a wide variety. While you’ll certainly find more white wines there are some stellar reds produced by various wineries utilizing the entire Okanagan and its various microclimates. 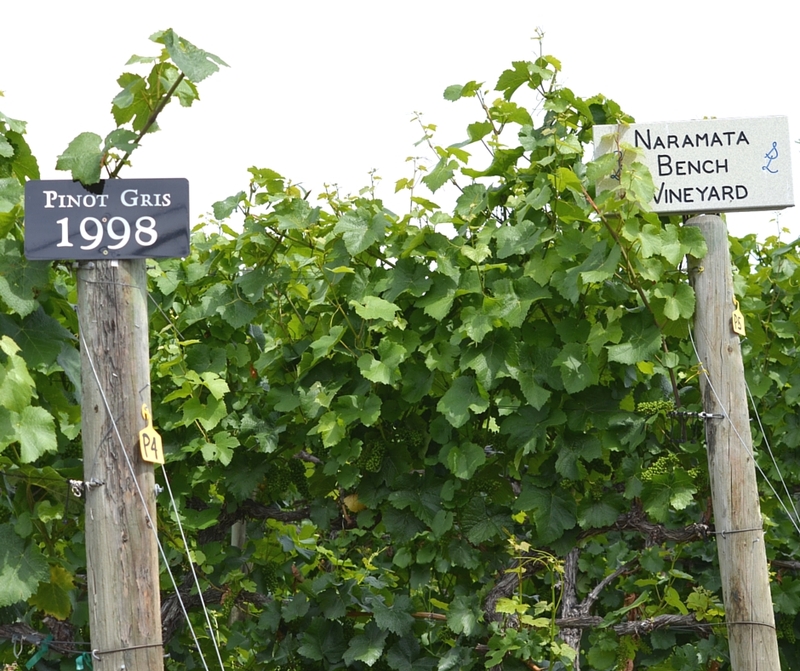 So not everything you try will be grown and harvested in the vineyards you walk through on the Naramata Bench. Here are a few of my all time favourites to bring visitors but I encourage you to take a chance on any vineyard that inspires you to do so. 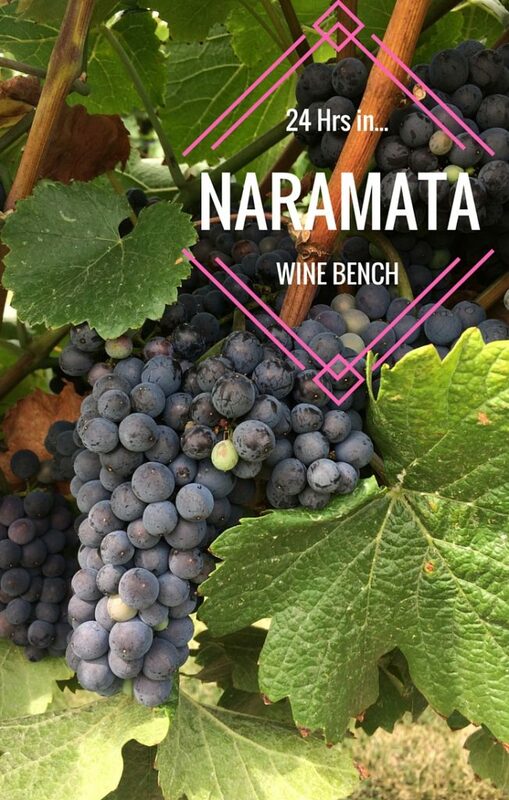 The Naramata Wine Bench is often compared to Napa but unlike Napa tasting fees rarely exceed $5-$7 per person and are often waved when you purchase a bottle of wine. I’ve written about the genius of their marketing and labels before. People buy their wines for their labels but their wines are delicious and perfect for parties too. They also have a guest house if you’re interested in staying on site at a vineyard with a hot tub and views of their vineyards overlooking Okanagan Lake. You can grab a bite to eat from May to August with sandwiches served at Sig’s Grille on the patio. If I had to choose only one winery to visit it would be Bench 1775. The Chill (a gold medal winner) and Glow Rosé are staples in my wine cabinet come summertime. On certain weekends when they aren’t booked for a wedding they feature music and a pizza oven on the patio with a killer view. Cheese and wine go together like milk and cookies. If you love your fromage as much as your vino then get thee to Upper Bench Winery & Creamery for their wine and cheese pairings. A bottle of Chardonnay in one hand and Upper Bench brie in the other – You won’t leave empty handed! While it isn’t flashy in any sense of the word it does have a great tasting room and comfy patio. It is also the nearest winery to Penticton from this list so if you’re staying at the popular Penticton Lakeshore Resort you don’t have an excuse to not go wine tasting without leaving town. I like this winery for its new sparkling Chardonnay (delicious!) and relaxed vibe. This was one of those new wineries I decided to visit. For some reason it called to me more than any others and I am glad we stopped. Their selection of reds and white are sublime and the grounds offer a charming feel, almost like you’re visiting a friend’s home, with a stellar view of the lake. 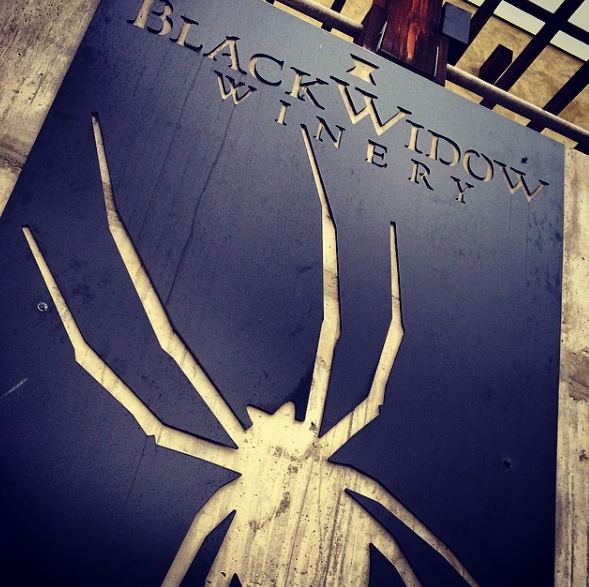 A permanent favourite of mine for its small boutique feel and use of the arachnid family within their labels and decor, Black Widow sells out fast. If you are wine touring in the area during the harvest months you’ll probably arrive to find that their wines are almost all sold out if it’s not closed for the season. 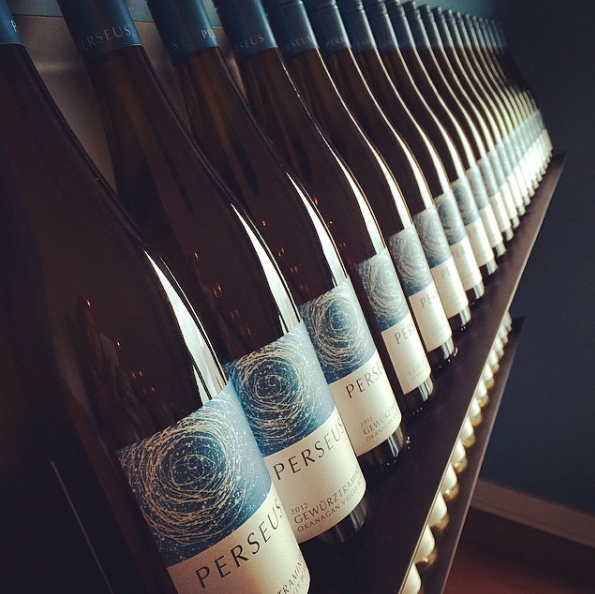 Their Pinot Gris, Oasis and Muscat are all great summertime wines. 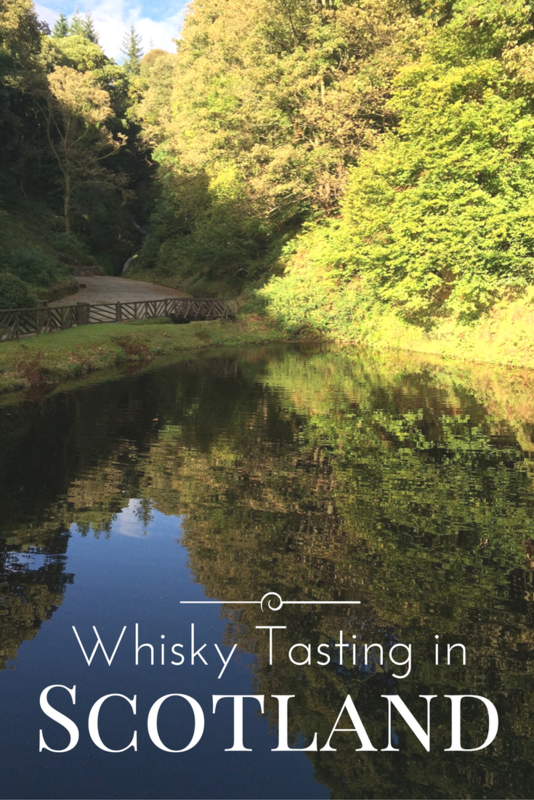 If you’re experiencing palate fatigue because you went for it and tried more wineries than you should have there are alternatives. 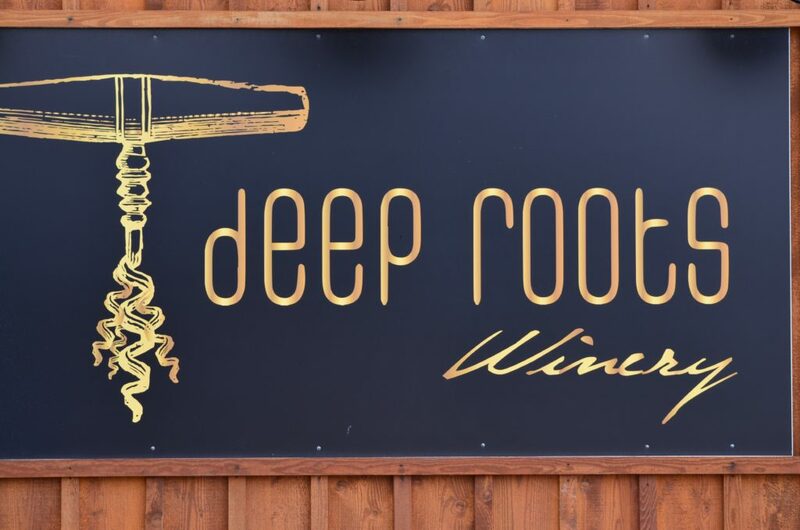 Or if you’re touring with someone who doesn’t particularly like wine you can bring them to the following establishments that offer the unexpected in wine country. Legend Distilling offers gin and vodka made with local ingredients and in small batches. You can also pick up a unique vodka spiked coffee blend called Blasted Brew. Definitely something different to bring home from the Okanagan wine region. Maple Leaf Spirits has a long list of spirits to sip on labeled with the classic Canadian emblem, the maple leaf. bring home maple liqueur, fruit brandies, or a Canadian version of grappa. The perfect spot for fruit wine lovers who enjoy that sweetness that can only come from a blackberry wine. Their wines are too sweet for me to drink or keep in the house but I enjoy the occasional tasting at Elephant Orchard. It’s a funky place that is always busy. For wine enthusiasts they do have samples that claim to appeal to even the pickiest and purist of winos – give the NaySayer Cab Franc/Merlot blend or Told You So Viognier a try.